In his 1993 essay on 3D cinema, ‘The Aesthetics of Emergence’, William Paul argues that the medium’s ability to bring objects out past the screen and into the audience space - which he terms “negative parallax” - constitutes a “challenge to the dominance of the classical style.” 3D film, for Paul, can be read as “an example of an atavistic return to […] the ‘cinema of attractions’.” The ‘cinema of attractions’ is a term used by Tom Gunning and André Gaudreault to describe a cinema typified by the ‘real life’ vignettes of the Lumière brothers and the trick films of George Méliès: films lacking in narrative and more concerned with showing the spectator a spectacle for its own sake. For Gunning, this is a cinema in which “theatrical display dominates over narrative absorption, emphasizing the direct stimulation of shock or surprise at the expense of unfolding a story of creating a diegetic universe.” Story and realism suffer, victims of the spears thrown out of the screen. As Paul puts it, the “emergence effect” means that “breaking out of a frame calls attention to the frame that is being violated.” Spectators, then, are perpetually bombarded by reminders that they are sitting there in a darkened auditorium, having stuff shown to them. This logic still structures many criticisms of 3D film. In 2009, Hollywood seemed determined en masse to differentiate the new wave of stereoscopic cinema, putting an emphasis instead on 3D’s immersive potential. As Avatar’s producer Jon Landau told Sight & Sound, “we don’t view 3D as a world coming out of a window… We view it as a window into a world. What you want to do is immerse your audience in the world of the story you are telling.” In a recent article for Film History, where he argues that “protrusion brashly announces the new technology’s thrill-value,” Scott Higgins suggests that a “depth-oriented aesthetic has developed as a more respectable and perhaps sustainable option.” The “emergence effect”, or “protrusion”, then, becomes the new taboo - illusory distracting and improper. Paul noted in his article that “if 3-D [sic] has never left the fairground, then the fairground never quite left 3-D”, and a lot of people seem very intent on reassuring us that we’re not at a fairground. We’re in a serious picture house, thank you very much. Oz: The Great and Powerful isn’t as desperate as all that. There’s a load of “protrusion”. Things are hurled gleefully at the spectator all the time: flames, bubbles, flying monkeys - you name it, Oz chucks it. This is not to suggest that the film uses stereoscopy blithely or haphazardly. Its deployment of 3D is thoroughly considered, cannily contributing to a story about the power of illusions, and how improperly those illusions can distract us. Nor is the film a full indictment of those illusions. Rather, it suggests that illusion can be used towards positive ends, if only we face its true power and understand its purposes. In this Alternate Take I intend to delineate how emergence is used throughout the film in order to unpack the narrative’s attitude towards its own spectacle, and chart its protagonist’s move from being distracted by display to eventually using it for good. Oz: The Great and Powerful tells us that even if Oscar Diggs manages to leave the fairground, the fairground never quite leaves him - but that this doesn’t have to be a bad thing. The film’s opening credit sequence gives an indication as to how it will use stereography to complement a narrative of depths and surfaces, and the beguiling pleasures the latter can offer. Shadow puppets move about in a pop-up theatre, their flatness at odds with the stereoscopic depth of the image. The plunging trajectory of the camera, continuously tracking into the far reaches of this impossibly elongated space, moves through raised cardboard curtain upon raised cardboard curtain. The marked illusionism of the represented figures and the artisanal charm of the theatrical environment are investigated by the camera’s constantly forward search, a quest to delve into the depths of this shadow play and investigate what they might represent. The narrative begins with another forward-tracking camera, this time craning down and roving through a carnival grounds in Kansas, 1905, showcasing the wealth of showmanship on display. That the film begins in black and white academy ratio further inculcates an impression of artifice, and nostalgia for a more old-fashioned mode of entertainment - be it the classical Hollywood cinema or the funfair. A tout implores, “Step this way, get your tickets!”, welcoming us into the spectacle and acknowledging our status as paying costumers for what lies beyond. The camera tracks past him, revealing a fire-breather showing off his stuff. He spews a torrent of flame that stereoscopically emerges into the auditorium. This is a marked moment of negative parallax, marked even more so by the flames’ ability to escape the borders of the 4:3 frame. The flame moves beyond the bounds of this curtailed image, past these black imposed curtains, addressing the spectator directly. This method of accentuating the transgression of negative parallax through playing with the aspect ratio was also used in last year’s Life of Pi, in which flying fish leapt with abandon out at the audience and past impromptu proscenia at the top and bottom of the frame due to a widening - and thus shortening - of the frame. Whereas in that film the transgression emphasised a sense of Pi’s being overwhelmed by the creatures’ total occupation of his - and the audience’s - environment, here the surpassing of the boundary is a moment of self-conscious display, a welcome to the fairground. Emergence doesn’t detract from this narrative world; rather, it announces itself as an opportunity to revel in the confrontational spectacle that this world can offer its spectators. In many ways these moments recall an early moment from the 1953 3D film, Andre DeToth’s House of Wax, where a tout outside the titular wax museum, directly addressing the camera, vaunts the spectacle inside. He holds a paddle with a ping-pong ball attached to it by a piece of elastic and whacks the ball out into the audience space repeatedly. Emergence is linked to spectacle, but it is a spectacle that shamelessly announces itself as such. William Paul has noted that this film is also an investigation into the potential misdirection of ostentatious display - the waxwork models constructed by the showman, played by Vincent Price, are in that film much more sinister than they initially appear to their gawping onlookers. The beginning of Oz is also concerned with the damage wrought by such showiness. The aforementioned tracking crane shots comes to a rest on a drawing of ‘Oz The Great and Powerful’, painted on a placard outside Diggs’ tent - the promoted image rather than the man himself. The film then cuts to inside the tent, and promptly begins to investigate the man behind the poster. A young woman, May, sits at a dressing table, looking at her reflection in a mirror placed on top of it. She takes an ornate piece of headwear of seemingly exotic provenance from the table and puts it on. She admires herself, but Diggs appears behind her and removes it from her head. “You won’t need this,” he tells her. “You are playing a simple country girl.” May’s dreams of not being in Kansas anymore are quashed, subsumed into the role allotted to her in the mind of Oz. He offers her a music box, telling her that it belonged to his grandmother - a war hero, apparently - and that he “know[s] that Grammy would want you to have it.” We see here Diggs’ cavalier attitude to romance, his readiness to repurpose the women in his life in order to facilitate his own conquests. May will be his assistant, serving him by being used by him. She will say what he wants her to say, do what he wants her to do, and be who he wants her to be. Frank, as aware of what’s going on behind the curtain as the New York author he’s presumably named after, informs her that Digg’s last assistant “suffered from a broken heart.” Diggs interjects an end to the sentence - “attack” - to let his conscience off the hook. That it does so that is glaringly indicative of his callous lack of regard for others’ existence outside his own fantasies. The show itself starts of promisingly. He pretends to hypnotize May, invoking the ether and possessing her with the spirit of “Queen Fernanda”, repurposing her yet again to suit his own needs. He then levitates ‘Fernanda’ off the floor. Crowd members point out they can see the strings holding her up. “What need have I of wires?,” Oz bellows, before asking Frank, who waits in the wings, for a machete. He chops the wires away, and yet still his newly possessed assistant floats on air. It was all part of the act - an acknowledgement of covering wool over his audience’s eyes to bolster his spectacular persona further. A caveat: such prestidigitation comes with consequences. A young girl in a wheelchair sitting in the front row, eyes wide, bleats out, “Make me walk!” Oz’s spectacle has been mistaken for something more genuine, a messianic ability to affect difference for others in the noumenal world. He tries to shrug this off with an embarrassed “Not now kid” but her parents seem to think he can finagle the feat too, offering them all the money they have to make their daughter walk. She pleads further: “I believe in you.” Alas, Diggs is powerless. He protests, bullshitting an indignant audience that he “would make her walk but unfortunately there is a distemper in the ether” - the particular distemper in this case being that there actually is no ether. He storms out of the tent, calling Frank a “trained monkey” and contemptuous of his implications that he is Diggs’ friend rather than employee: “Friend? I don’t need a friend. What I need is someone who can close the damn curtain.” Frank tells him that he doesn’t understand why Diggs just didn’t tell the little girl the truth. He scoffs at this: “What truth? That I’m a fake?” He tells Frank that everybody would have asked for a refund. Oscar Diggs, then, is a man who dismisses truth in preference of showmanship and capital, keen on lying to women and hiding his inadequacies from paying customers. What is important to him is that the material world be of use to his fantasies, rather than the other way around. There comes now a moment indicating that Diggs is not entirely comfortable with this aspect of himself. A woman knocks on the door to his caravan. Frank offers to bring out another music box, but Diggs sees who it is waiting at the door - “Not for this one, Frank.” The woman who is so special to Diggs is Annie, but she has come to tell Diggs that she is to marry John Gale (the surname recalls The Wizard of Oz, hinting that perhaps Annie is actually the mother of that film’s Dorothy Gale) - unless Diggs can think of any reason why she shouldn’t. She calls Diggs a good man. He replies that John Gale is such a beast, but, even though he himself is “many things”, “a good man isn’t one of them.” Annie tells him that he could be if he wanted to, and he counters, “That’s just it. I don’t want to be.” He tells her that Kansas is full of good men, like John Gale and his father, who spent his life tending the earth before being buried in it. Diggs dreams of something more transcendent. He wants to be a "great" man. He turns on a praxinoscope, throwing images of dancing elephants over the walls of the caravan and their faces as he recounts his fantasies, thus associating these dreams with the ‘magic’ of moving pictures. He tells her that he wants to be “Thomas Edison and Harry Houdini all rolled into one”, compressing the concepts of cinematic illusion and the self-aggrandising escape. Annie tells him that this is all she has ever wanted for him: “Greatness.” She understands, he tells her - she is sympathetic to his need to escape into illusion in order to achieve greatness. Is this a valid need, though? Annie replies with a question that hints at this doubt: does he understand himself? This question is left hanging in the air, floating alongside the phantasmagorical elephants in the room. They kiss, but the moment is interrupted by Diggs espying something alarming out of the corner of his wandering eye: a circus strong man is storming towards his caravan, throwing his wife’s recently acquired music box to the ground and charging like a bull toward the ramshackle home of the cuckolding braggart who gave it to her. Diggs tells Annie that he will see her in his dreams, and promptly scrams. The strong man bursts into the cabin. Diggs throws out a white sheet before him, which transgresses the sides of the curtailed frame as it emerges, and shouts “Zim Zalabim” before disappearing into thin air. The strong man walks over to where he had stood, and sees a trapdoor open in the bottom of the caravan, out of which Diggs has escaped. The emergent bed sheet bespeaks irresponsibility and the specious illusion that masks it, but it's a trick that doesn’t take long to suss out if you know where to look for the escape hatch. 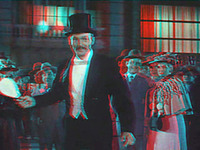 It is notable in this sequence, stereoscopically, that moments of emergence transgressing the margins of the 4:3 frame are often associated with Diggs’ trickery and escapism - the bed sheet, for example, and the dove that flies out of his pocket as he flees the strong man - but when negative parallax is directed frontally and fails to breach this academy width it is associated with a Kansas-bound threat - such as the strong man’s fist flying towards the camera, into Diggs’ face. Negative parallax can thus bespeak either how affronted Diggs feels by the invasiveness of this “dusty Podunk” or, when the transgression of the diminished aspect ratio explicitly “calls attention to the frame that is being violated”, his means of escape from it. All this changes, however, when he is whisked away by a computer-generated tornado to an vast namesaked land. Waking up in the balloon’s basket after the worst of the storm, the spectator is treated to a 4:3 shot of the sky above the basket’s rim, snow falling down onto the lens, past the rim and emerging out into the audience space, past the margins of the academy frame. A shot of Diggs’ waking face shows him coming to as colour begins to seep into the image, slowly turning to sepia. Diggs stands, and in a long shot the margins of the frame begin to widen as more and more colour saturates the image, until we see the balloon, floating over a stereoscopic candy land in depth. There is no need for snowflakes to escape the sides of the frame any more. Just as Dorothy Gale wandered out of her sepia shack into the Technicolor manifestation of her yearning, Diggs’ narcissistic fantasies are let off the leash as the dream of Oz opens out, extending over and enveloping the entire stereospace. Emergence, from now on, does not to call as much attention to its entrance into the audience space. The dream has become total, with camera movement serving to carefully proscribe negative parallax’s potential to disrupt spectator involvement. In the early shots of the land of Oz, this care manifests itself in long panning and tracking shots, often aligned with Diggs’ point of view, that strive to keep the emergent objects - such as a hummingbird and the butterfly that turns out to be the leaf on a butterfly tree - in the centre of the frame, with a minimal amount of foreground mise-en-scène so as to reduce a sense of separation. When emergence is glaring - as it is when the water faerie spits water in Diggs’ face, an evil plant reveals itself, or a winged baboon flies up towards the lens - it is contextualised as threat. Mostly presented from the point of view of the protagonist, these moments’ rapid movement towards the audience marks them as confrontations against the hero and the spectator who happens to be aligned with him. The violence’s transgression recalls the strong man’s fist, or the train filmed by the Lumière brothers that arrived at La Ciotat Station in 1895 (and happened to converted into 3D in 1935). Explicit, demonstrative display becomes something to be wary of, an ally of things that might be Great in their Power but not necessarily in their Goodness. It seems as if the land of Oz is trying to tell the man something about himself, as if he’s talking to himself in his sleep - and the message is a not a kind one. Reactions to the film’s treatment of its women have not been kind either - and with good reason. As Natalie Wilson points out, whereas the 1939 film presented audiences with a heroine “daring to have opinions and act on them”, Oz the Great and Powerful “trades in the notion that women are indeed wicked - especially those women not “tamed” by a male love interest or father figure, as well as (horror of horrors!) those women who lack nurturing, motherly characteristics.” I don’t want to argue with this position, but I would like to complicate it somewhat. Oscar Diggs is, as I have shown, a character with little respect for others around him. Once in Oz, he meets a series of women, all of whom conform to regressive patriarchal stereotypes of femininity: The Little China Girl, who needs to be protected, caught when she falls, and can only get her own way by crying into Diggs’ trouser leg; Theodora, the ingenuous debutante who needs to be guided in the ways of love lest hell hath its fury; Glinda, the matronly nurturer who’ll support our hero no matter what; and Evanora, a conniving two-faced femme fatale. Diggs’ relationship to these women isn’t particularly nuanced - he’s a father to the first of the four, and flirts it up with all the others like gangbusters. These characters, then, are not women in any real sense - they’re just Digg’s limited conception of what women mean to him. Diggs is a man who can dream spectacular vistas of butterfly trees and hordes of winged monkeys but who is unable to conceive of a woman who would pass the Bechdel test. Perhaps this lack of respect is something to do with his love of fantastical display over reality. He’s living in a dream world, after all. Diggs’ desire to be Edison and Houdini “all rolled into one” and its insinuation that he’d rather escape into the movies is pertinent here. To demonstrate why, I want to digress for a moment, and consider David Thomson’s work on how intertwined our relationship with others and with the movies can be. In The Big Screen: The Story of the Movies and What they Did to Us, Thomson observes that the rise of divorce and the rise of the motion pictures’ popularity in the early years of the twentieth century (at about the same time that Oz’s story is set) was concurrent: “In 1900 in the United States the divorce rate was 84 per 100,000 men, and 114 for women. By the early 1930s, the figures were 489 and 572. (By 2000 they were 9,255 and 12, 305. )” He is careful to assert “the movies did [not do] that alone”, but is keen to observe that, nevertheless, “the movies were a sensational public spectacle where audiences were encouraged to gaze at good-looking people (different ones every week) and dream of their chances.” Display begins to distract from reality. Being “not really there”, then, for Thomson, means that audiences are “less inclined to fix upon the means of choice in love and marriage than yield to the parade of dreams that are more likely to become glamorous and sexual, as opposed to matters of character and context.” This occasions “another level of consciousness: to pass through shared reality well enough, but to keep a special private room alive behind our eyes, the one where anything is permitted, the one where every dutiful husband may be a Bluebeard. More than that, we may be inclined to give up on the old real life because of the infinite glories of the fantasies, the dreams.” This is, admittedly, a rather gloomy view of the movies, but it might explain what has happened to the Edison-obsessed Oscar Diggs. In thrall to the infinite glories of “the fantasies, the dreams”, has he given up on “the old real life” to dream of his chances? Has he pulled a Houdini so that he is no longer “really there”? Not that this lets the film off the hook. As far as the Bechdel test goes, it’s embarrassing. Sure, women have conversations without a man being present, but they’re either about how their daddy’s died, leaving them in the lurch, or about how Oz can save them all and rule the kingdom, or interspersed between magic-fuelled girl fights that beg the question: if their magical powers are so considerable that they can do this to each other, then why do they even need this huckstering mustachioed blowhard in the first place? The film is as guilty as Diggs is. Nevertheless, if we read the Oz portion of the film as a dreamwork like the 1939 film - where different characters in Oz are the equivalents of the people the protagonist knows in Kansas - then a strain of oneiric self-criticism begins to insinuate itself. The China Girl and her broken legs, then, is obvious enough: she stands for the little girl who could not. Finlay is the trained monkey Diggs insulted Frank for being, and the means of relieving his guilt over that insult by calling the primate a partner and a friend. In the former case, Diggs displays that if he could affect good, then he would; in the latter, he shows that he is, deep down, capable of appreciating people as kith rather than crutches. The three witches, though, are horses of a different colour. Read as cyphers relating to Diggs himself - it’s difficult to read them as anything more - the film reveals a project of doubling that demonstrates a shift in Diggs’ attitude towards spectacular, illusionistic display. Theodora, at first glance, doesn’t have an equivalent in Kansas. Diggs seduces her by giving her one of his music boxes. She is touched, telling him, “No one’s ever given me anything just because they wanted to”, misunderstanding that the only reason he has given it to her is because he, in his selfishness, only wants her. They dance. It is her first time doing so. Both seem enchanted by the spectacle of the firelight mountaintop upon which they glide. The morning after, Theodora is besotted with Diggs, anxious to reign alongside him as his Queen. She’s astounded by his frightening away of a lion, even if he tells her that the puff of smoke he used was only a little bit of “prestidigitatious display”. She tells him that he is the person she belongs with, to which the commitment-phobe can only reply a sheepish, “Well, we sure get along.” Later, hurt by his disinterest, she takes a potion and turns herself into the Wicked Witch, green and ugly and intent on remaining so, embodying a testament to what Diggs has made her. There are clues to indicate that Theodora is a vengeful dream version of May from the Kansas prologue. ‘Theodora’ sure does sound a lot like ‘Fernanda’, the queen who possessed May at Diggs' behest. Both May and Theodora look at themselves in a mirror and see a change affected by Diggs’ conception of them: Theodora sees the tears fall down a burn the flesh of her cheek, foreshadowing her transformation into the Wicked Witch, for whom water is fatal (her ultimate end in the 1939 film, then, retroactively harks back to Digg’s callousness); May has her hat taken off and told she must remain a “simple country girl”, like a queen whose spectacular crown is whisked off her head and told that she’s nothing more than a one night stand. Theodora, though, is given the opportunity to break the mirror reflecting her image, and the shards fly out at us like knives. Later, when she reveals her new look to Diggs, her pointy-noised face emerges far out into audience space in a lingering, daunting close-up - a confrontational use of negative parallax displaying the effects of Diggs’ deception for both him and audiences to ponder. Glinda, then, points the way towards a curative, selfless use of deception. Rather than deploying it to save his own hide or to get what he wants, Diggs should to use his tricks and display for somebody else rather than himself. It is only in this way that he will emerge victorious, achieving what Glinda calls something better than Greatness: “Goodness.” Meeting Glinda sets Diggs off on the right track, using his skills for the better of others. A conversation with the China Girl allows Diggs to twig just how he is to go about achieving this elusive Goodness. 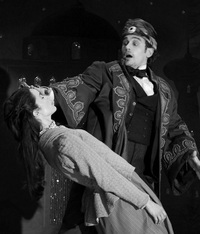 He is able to admit to her, after his confessional conversations with Glinda, that he is just “a carnival magician”, and “not the man you want me to be.” In admitting that he is not the kind of wizard who can grant wishes, he delivers himself of the inadequacy he felt at not being able to make the little girl in Kansas walk. Essentially, he ceases to believe in his own act. What’s important, as Glinda told him, is that he “make them believe” in it. So he talks to the China Girl about Edison, describing him as “the kind of wizard I’d like to be.” He describes how even though Edison couldn’t grant wishes per se, he “could look into the future and make it real”, and describing his creation of a camera that took “moving pictures.” The China Girl is astounded by this last concept, her voice filled with awe. “With almost nothing”, Diggs proselytises, “he could make the impossible real.” The China Girl tells him that she’d rather he be the kind of wizard that grants wishes, but “that’s a good wizard to be.” Tellingly, Houdini doesn’t get a mention this time. Diggs’ plan to save Oz, in every sense of the word, is based on the positive use of sleight-of-hand for the goodness of others. As they prepare for the final battle, there is a telling moment when we see Diggs standing next to the Master Tinker. Both wear goggles and stare at something offscreen. Diggs asks his accomplice to “adjust the lens” and, seeing the effect, rejoices, “Edison would be proud!” Curative illusion is associated wholly with the cinema. Furthermore, it’s possible that the goggles recall the stereoscopic viewers worn by the spectator, insinuating that 3D might too have a role to play in this momentous charade. When the revenge of the giant face finally does occur, the film is as filled with references to the illusory magic of the cinema as the final scenes of Close Encounters of the Third Kind (1977), where onlookers who have travelled far and wide after a glimpse of coming attractions are treated to a grand show, with feeling and thought communicated through a symphony of light, music and colour. Here, the surrounding lights are snuffed out, and a projected image of a larger-than-life Diggs bellows, “Unleash the stars!” (He’s talking about fireworks, but he might as well be talking about Grace Kelly and Cary Grant.) At one point, Diggs’ face gets bigger after adjusting a lens - an emphatic and giganticising zoom. 3D also serves to underscore the spectacle as a moment of illusory display. When Evanora’s men throw spears at the smoky spectre that towers above them, the spears pass right through Oz’s giant face. It’s just smoke and mirrors, after all. The spectator is treated to a shot taken from behind the plumes, the vainglorious spears flying out from the backside of the misty phantasmagoria and directly at the camera. Their strong negative parallax, as Paul might say, “calls attention to the frame that is being violated.” For the first time since in quite a while, though, forward-moving emergence is not associated with threat. Instead this calls attention to the insubstantiality of illusion, the idea that if we’re aware of the trick then it can’t actually hurt us. That Diggs’ plan to escape in the hot air balloon is actually a load of hot air is telling - it's one last example of pulling the wool over everyone’s eyes, but this time it's for selfless ends. Diggs fakes his own death, retreating behind a curtain and “shed[ding] [his] mortal shell” to become “invincible”, as immortal now as George Méliès. As Glinda says of her father’s death, “She only killed a man. Not what he believed in.” The movies, unlike the people who made them, will live on. Though Evanora threatens Glinda that “I’m going to wipe out your light until there is nothing left but my darkness”, the projected light can send out a message of hope to keep the darkness at bay. It’s only a movie that Diggs creates, yes, but it’s a movie that can be used for good. I haven’t yet identified a Kansan equivalent for Evanora, the duplicitous schemer who hides her true face from everyone through illusion. Greedy to keep the riches of the Emerald City to herself, she manipulates Theodora by lying and presenting a music box to her, transforming her into an embodiment of scorn. Evanora, then, can quite easily be read as a personification of Diggs’ doubts about the dark parts of himself, a demonstration that his deceitful spells, when used to further his own ends, will only prove hurtful to others. Glinda - the idealisation of Annie - breaks Evanora’s talisman, revealing her true form and guaranteeing that “everyone will see you as you truly are.” She acknowledges the darkness within Diggs, but helps him to put on a light show instead. In doing so, he will be able to banish the darkness for good. Ding dong, the witch is fled. The film ends with a kiss between Diggs and Glinda, the former finally daring to bring someone else (or, rather, the dream of someone else) behind the curtain. During the kiss, their joint movement accidentally turns on the projector bulb, throwing a silhouette of their embrace against the curtains. This is a polar shift from the palpable disappointment sensed at the end of The Wizard of Oz that the Great and Powerful Oz is merely a little man hiding behind a curtain. Through narratively and stereoscopically exploring spectacle - both its spectrality and its palpable power - this film rejoices in our opportunity to see the curtain for what it is: a means of romanticising experience, of making things bigger than life. Nevertheless, such idealism cannot curtail the unease regarding fantasy’s escape from lived experience. Theodora flies away, screaming “Never!! !” on the broom that Diggs suggested for her, after his projected visage admits, and pleas, for all to hear, “I know your wickedness was not your doing and should you ever find the goodness within you, you are welcome to return.” There follows a cut to a close-up of Diggs, sitting in the dark in his caravan, his head hung low. So much damage has been wrought by darker dreams that there may no longer be any way back. We might now do well to remember Professor Marvel from The Wizard of Oz: a lonely old Kansan huckster in a decrepit caravan, his best days long behind him, who still keeps Thomson's "special private room" alive behind his eyes. Maybe he still dreams of an embrace’s silhouette thrown against a green velvet curtain. Perhaps he still clings in the dark hours to the fantasy of a lost lover, a good woman who once told him that he wasn’t all that bad, really. At least Dorothy made it back home. This Alternate Take was published on April 05, 2013.